As parent, We should give kids more freedom to let them know the world better.when we take them to the outdoor or public, They run around or walk down and up.If you don't pay attention, They may disappear into your field of vision. What a terrible nightmare? We hope that we would never suffer from this. 1. The design of the belt makes the baby's hands free so that they don't resist. 2. Ranges 2.5M, the longer, the more independence and freedom during public or outdoor activities. 3. Built-in bold Stainless Steel Wire, No need to worry about breaking or wearing itself. 1. 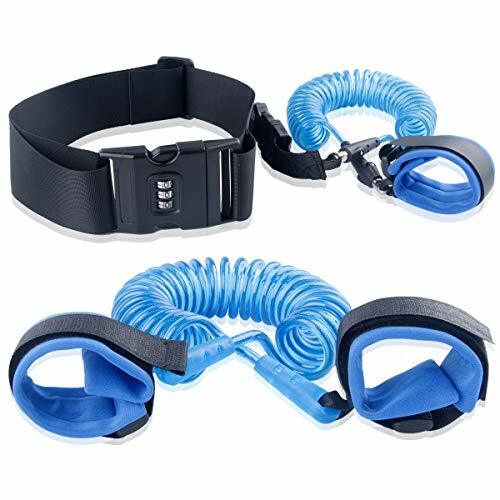 This product is used to prevent children from losing, But can't train children to walk. 2. This anti lost belt has the elasticity, Parents should keep following the kids closely to avoid the pull making kids lose balance and fall when going out. ♛【THE MUTUAL FREEDOM OF KIDS AND PARENT】: Anti-lost belt and wrist can give the freedom between kids and parents, and keep the children playing and exploring the new world with safety in the public while you might be chat with you friends or shopping etc. However, your kids is still close to your around. ♛【DOUBLE SECURITY LOCK】 : The child safety wrist strap have a key lock between the belt and link ,which key is in the place of wrist of parents . The other is a password lock on the belt, Which the original password is "000". Children will not easily open to escape line of sight, and is given double security. ♛【COMFORTABLE WRISTBAND AND BELT】: The fabric of wrist are very soft and skin-friendly, built-in sponge in the wristband is comfort and breathable that will not cause prickly and itchy of the skin for toddlers and parents. Kids will not feel uncomfortable since the belt width is just right, and makes the baby's hands free so that they don't resist, more freedom and enjoyment. ♛【STRETCHABLE LENGTH AND DURABLE USE】: Double-layer and lightweight PU plus built-in bold stainless steel wire can be extended to 2.5m and can be automatically retracted without wrapping on the foot or mopping the floor, it is convenient storage. Link is too solid to cut by knife or scissors. ♛【360°ROTATIN AND LARGE SPACE ACTICITIES】：The connector between the belt and link is costumed metal clasp, which can rotate with 360° to prevents wrap, and it is not easy to wear. The length of link is up to 98.4 in to provide the lager space to enjoy the pleasure time for kids. You use it in the public like trip, theme park, shopping mall, supermarket, street ect. If you have any questions about this product by OPOLEMIN, contact us by completing and submitting the form below. If you are looking for a specif part number, please include it with your message.